Home » Investment News & Information » Posts » Publications » Investor CAFÉ » Investor CAFÉ Newsletters » The Impossible Year: Cubs Win… Is Trump Next? It has been an improbable year: the curse of the Billy goat was lifted on the Chicago Cubs and they won a world championship in baseball after a 108-year drought. Among my friends, I predicted they would win it all this year and celebrated the victory with my daughter, who lives in Chicago, and reveled all night long. It was an exhausting night — a five-hour game where both teams had a real shot at winning. Incredibly, the seventh game of the World Series was not decided until the very last out in the bottom of the 10th inning with the potential tying run on base in the person of speedy Rajai Davis. Root and other Donald Trump supporters believe that next Tuesday’s election is our own Brexit moment, which they call Trumpxit. Certainly, the race has tightened in the last two weeks, as the oddsmakers have raised the prospect of a Trump victory, but it still is Hillary Clinton’s lead to lose. Why has the stock market fallen for seven straight trading days? Because investors fear a Trump presidency will create a similar situation to what happened in Britain after they voted to leave the European Union: the end of the bull market in the dollar and stocks, and a sharp rise in the price of gold. If Trump wins, I fear that like the World Series, it will be an all-night affair, waiting until the wee hours of the morning before the election is decided. Anything is possible. If Utah votes for a third candidate, the next president of the United States may be elected in the U.S. House! The Political Fed Postpones Rate Increase: Good News for Democrats? As expected, the Fed has decided to postpone a decision on raising rates until at least December, after the election. The Fed has been super liberal in expanding the money supply (nearly 10%) in response to a sluggish recovery. Gross Output (GO), the broad-based measure of economic activity, and my Skousen B2B index both were released today for the second quarter, showing mild 1.1% growth for both. Business spending had been down three quarters in a row prior to this announcement, so the economy is starting to move back up, but only tepidly. See my full press release at http://mskousen.com/2016/11/second-quarter-gross-output-and-b2b-index-increase-still-no-signifficant-growth-of-the-u-s-economy/. Last week, I attended and spoke at the New Orleans Investment Conference, the granddaddy of gold bug conventions. I reported last year about attendees who claimed they had lost up to 70% of their portfolio by investing in penny stocks. I moderated a panel on global investing that included Doug Casey, Adrian Day and Dennis Gartman — all commodity experts. I asked them to name one mining company that has a good long term track record like Apple, Procter & Gamble, or Exxon, and they couldn’t. Major miners such as Freeport, Barrick, or BHP are all volatile stocks, but have no long-term upward trend. And they pay very little in dividends. Day suggested Franco-Nevada Corp. (FNV), but Franco-Nevada is not a traditional exploration and development mining company. Rather it is a finance company that is paid royalties from mining operations. Even Doug Casey admitted that penny mining stocks are like burning matches. If you hold a burning match for long enough, you will get burned. My talk in New Orleans was on “The Three Greatest Threats to Your Wealth Today.” They were government policy (taxes, inflation and strangulation), bad investment choices and bad timing. What about gold? 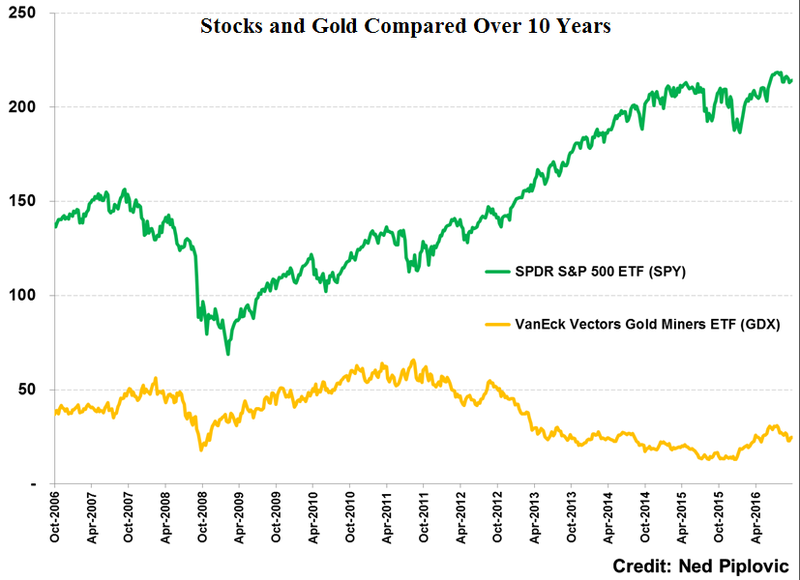 I showed this chart demonstrating that mining companies are not able to make consistent profits like most companies on the S&P 500. In summary, mining stocks should be viewed short-term speculations, never long-term investments. When you buy a gold stock, you need an exit strategy. Many of the investors at New Orleans had made good money in mining stocks this year, and I told them to take some profits and not get greedy. Of course, as soon as I said that, gold stocks have started to move back up, due to fear that Trump might get elected, so there may be more life in the gold bull market. Dennis Gartman, the commodity guru, scolded Donald Trump for being anti-trade. Gartman used the example of his hometown of Akron, Ohio. The old economy of steel and cars is gone, but it has been replaced by higher-paying jobs in high tech. “The old jobs will never come back, nor should they,” he said. My long-time friend Doug Casey has doubled down on his forecast of the “greater depression” to hit the world and end Western civilization as we know it. He’s been crying wolf since the early 1980s in his book “Crisis Investing,” and I’m surprised he still has followers who believe in this far-fetched prediction. If the 2008 financial crisis didn’t bring down Western civilization, nothing will. Three analysts (Dennis Gartman, Robert Prechter and Peter Boockvar of the Lindsey Group) stuck their necks out at the New Orleans conference and predicted that interest rates have finally bottomed. Certainly, rates have risen a bit in the past month, and one wonders how rates could get any lower after witnessing negative rates in Europe. Historically, the low-rate environment is unprecedented. If rates have bottomed, you heard it here first! ‘Maxims of Wall Street’ Sold Out in New Orleans! The copies of my book that I brought to New Orleans sold out at the conference, and many attendees bought several copies to give to friends during the holidays. I’ve been collecting these quotations for more than 30 years, and I put them all together by category in this book. Alex Green (Oxford Club) calls it a classic. It has been endorsed by Warren Buffett, Bert Dohmen and Dennis Gartman (who keeps it on his desk and refers to it regularly). Now in its 4th edition, Maxims has sold over 23,000 copies. Amazon sells it for $24.95, but you can buy it directly from me for only $20 for the first copy, and all additional copies sent to the same address cost only $10. Investors like to buy multiple copies as gifts. And I autograph each book and pay the postage to recipients inside of the United States! It makes the perfect holiday or birthday gift to friends, relatives, business associates and your favorite broker/money manager. In fact, many have purchased an entire box — all 32 copies autographed — for only $300 postpaid to give to their clients and friends. To make your purchase, call Harold at Ensign Publishing, toll-free 1-866-254-2057. Or go to https://www.miracleofamerica.com/products/maxims-of-wall-street. The dramatic 8-7 seventh game was a fitting ending to a great World Series. Just as it looked like the Chicago Cubs were again going to be frustrated by some invisible curse of the Billy goat, the team came through and won it all against the Cleveland Indians. It was an improbable championship. After the Cubs trailed three games to one after the first four contests to leave the Indians needing just one additional win to prevail in a World Series for the first time since 1948. Somehow, the Cubs won two straight games to tie the series and set up a classic seventh game. The Cubs were ahead 6-3 in the eighth inning when a normally sure-handed infielder couldn’t handle a ball that would have ended the inning. Suddenly, the Indians came alive, scored three runs and tied the game. The momentum had clearly shifted in favor of Cleveland. The Billy goat was back. But then the rain came. The Cubs gathered together in a weight room between the visitor’s dugout and the clubhouse and inspired one another. Perhaps they were reminded of a saying in their clubhouse at Wrigley Field “Don’t let the pressure exceed the pleasure.” Whether God took pity on the Cubs and its long-suffering fans, the team won. But just barely! The game wasn’t decided until the very last out of the 10th inning in Cleveland with the potential winning run for the Indians at bat. So now, two curses of baseball have ended, and both were accomplished by one man, executive Theo Epstein, whose unique skills helped break the 86-year curse of the Boston Red Sox between World Series titles, spanning the years 1918 and 2004. Chicago Cubs owner Tom Ricketts hired away Theo Epstein as president of baseball operations to do the same for the Cubs. In just five years since Epstein’s hiring by the Cubs in 2011, it worked. Epstein is a master of “sabermetrics,” the new technology of baseball management that appraises players’ skills. He is also a big believer in the farm system, raising players internally instead of just buying players from other teams. Epstein added “character,” looking for players with a winning attitude and positive culture in the clubhouse. It all came together last night. 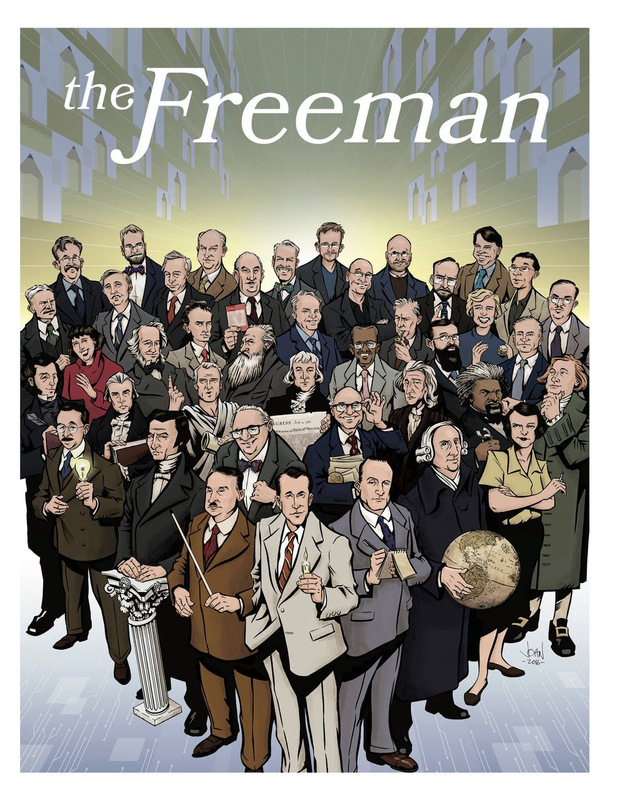 The Foundation for Economic Education (FEE) last month issued its final printed edition of “The Freeman” — see the cover below. FEE president Larry Reed announced that all future editions will be published online at www.fee.org.